One day, Donna from Cookistry had a great idea. Her great idea made me start thinking about decorating sugar cookies at Christmas. You know what I mean? Google sugar cookies and then click on images. You will see all sorts of glorious examples! Remember when you were little and your mom cut slices of Pillsbury sugar cookie dough, and then you used cookie cutters and sprinkles and candies, etc., to decorate them? Maybe you did this with your own children. Some of your moms, or some of you, were fancier and made sugar cookies from scratch! These thoughts made me think about doing the same thing, only with muffins and a houseful of people. Do you see what I mean? Have a basic muffin batter and have bowls of blueberries, nuts, sprinkles, and everything you can think of! Then people would gather round and put whatever they wanted in their muffin batter! So in the end, a muffin tin comes from the oven with 12 unique muffins! I LOVE this idea! Well, we just did that - Lauren, Brooke Miller (Lauren’s room-mate and sorority sister), Willie and me. It was SO FUN! Anytime I have a group of house guests, I plan to have these on the menu. The laughter that happened around my table the day we made these was priceless! It’s a great thing to try at the holidays, or anytime of year. Stir the first 4 dry ingredients in a bowl with a whisk (keep in mind, the dry ingredients can be measured, whisked and zip-locked ahead of time if it will make it easier for you the morning you make the muffins.) In a second bowl, whisk the remaining 4 wet ingredients together. Pour the wet ingredients into the dry ingredients and stir just until combined. Fill the muffin cups about 2/3 full. Arrange cups or small bowls with a variety of fruits and nuts or any other ingredients you think your guests will enjoy. 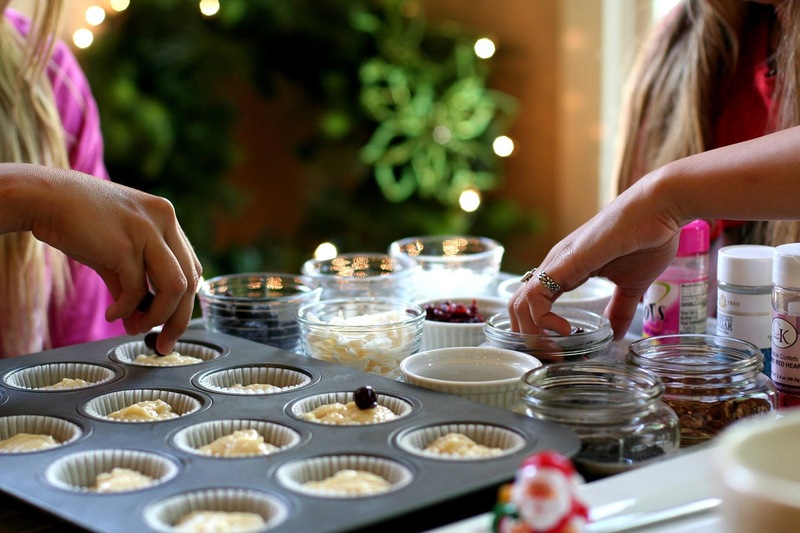 Invite the guests to gather round the filled muffin tin and add their ingredients. They can stir them with a small spoon, or chopsticks if you have them. Bake for 20-25 minutes. *Here's what I used when I made Mix & Match Muffins but I would encourage you to use anything you think might work! Try it, you might like it and create a whole new muffin!